← What does this hand gesture mean in Icons? On January 2nd, 1833 the great ascetic, Christian mystic, wonder-worker and spiritual father Seraphim, was found dead in his small cabin in the woods surrounding the Sarov Monastery, Russia. He was found kneeling in prayer before an icon of the Mother of God which had served as an inspiration for him throughout his life: the Umilenie (Умиление) or Tenderness Icon of the Mother of God. The Slavonic inscription around her halo reads: “Rejoice, O Virgin Bride” (Радуйся Невесто Неневестная) which is the refrain of the Akathist Hymn to the Holy Virgin. 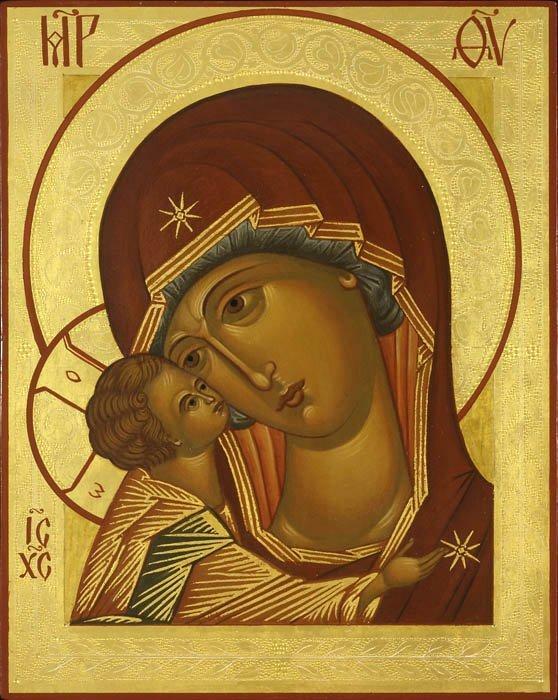 It has been suggested that the Icon, showing the Mother of God without the Christ-child, is influenced by Western, Roman Catholic, art where such images of Mary abound (e.g. this 17th century painting of Mary from Italy). However, given the moment of the Virgin’s life supposedly shown in the icon, it is not unlikely that the image was taken from the Royal Doors of an Iconostasis, where depictions of the Annunciation are common. Either way, any worries about the “un-Orthodox” origins of the icon must be seen in the light of St Seraphim, and his use of the Icon. St Seraphim was a monk in the Sarov Monastery, and later was made the spiritual father and priest serving a small convent in the nearby village of Diveyevo. During this time Seraphim lived neither in Diveyevo, nor the Sarov monastery, but in a simple, single-roomed log cabin in the wilderness of the forests surrounding both places. In this humble abode, in the corner opposite his stove, hung the Umilenie Icon, which Seraphim called “Joy of all Joys” (Всех радостей Радость). Seraphim would use the oil from the lampada burning before the icon to bless the many visitors who came to him for the sacrament of confession, anointing them with the sign of the cross after saying the prayer of absolution. Those who had physical illnesses reported being healed from this holy oil. Towards the end of his life, St Seraphim charged the sisters of the Diveyevo convent to prepare a suitable place for the Blessed Lady, indicating the icon, and gave them 1000 rubles for the job. After Seraphim’s death in prayer before the icon, the abbot of the Sarov monastery entrusted the sisters with the Icon, which then resided in the new building. It was soon decorated with a silver “riza” (a silver or gilt covering used to protect holy icons). Upon the glorification of Seraphim as a saint in 1903, precious stones were donated by Tsar Nicholas II to further adorn the icon. It is the icon’s connection with the both Seraphim and the Diveyevo convent which gives the Icon its third name – after “Umilenie” and “Joy of Joys” – the “Seraphimo-Diveyevskaya” (Серафимо-Дивеевская). This latter title helps to distinguish between St Seraphim’s icon, and other icons of the Mother of God called “tenderness” (in Greek Elousia), which are quite different and shows Mary pressing her cheek against her Son’s in an intimate portrayal of Mother and Child (example of the Elousia Icon). In 1991, the Icon was transferred from the Diveyevo convent to the Patriarch of Moscow’s residence, with a copy being left in Diveyevo. The original icon is often brought out on feast days for popular veneration, as in the picture above, taken on April 8 2011 at the Epiphany Cathedral, Elhovo. Although the devil deceived Eve, and through her Adam also fell, the Lord not only promised them, but also gave us, the Saviour in the seed of Woman. The Ever-Virgin Mary, crushing within herself and crushing in the whole human race the serpent’s head did not abandon the fallen human race, but, by Her eternal motherly care, the Ever Pure Mother petitions Her son and our God for the most desperate sinners. For this reason the Mother of God is called “the Scourge of the devils”; there is no possibility of the devil ruining a man, provided that man does not cease seeking the aid of the Mother of God. This entry was posted in History, Special Icons, The Theotokos and tagged Mother of God, Prayer, Seraphim of Sarov, The Annunciation, Theotokos, Umilenie. Bookmark the permalink. Excellent article. Could you please tell me the origin of the icon image at the very top of this page entitled “the tenderness icon of the Mother of God”? I hink it is an early twentieth century copy of the St Seraphim’s original “tenderness” icon. It is now in the Tretyakov Gallery. Has anyone ever photographed the original Icon at Diveyevo? I wonder if the Icon photo on the diveevo.ru website is a photo of St Seraphim’s actual Icon. Not the one with the lighter robe but the smaller one above it. If you look at the Icon in his cell it looks like she is wearing darker robes.can someone who writes Russian email and ask?